Why Has 319448 Not Been Repainted? 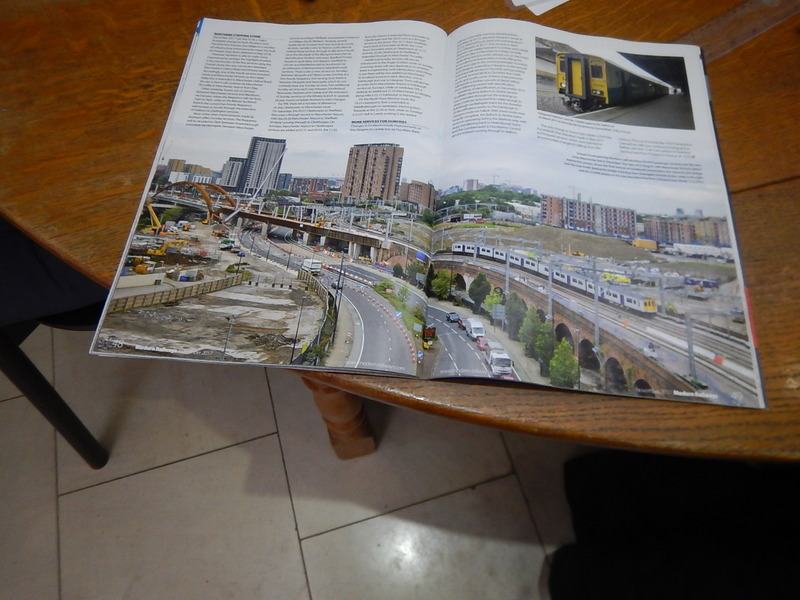 In the November 2017 Edition of Modern Railways, there is a picture of this Class 319 train passing behind the Ordsall Chord bridge on Page 49. The train is on the right hand page and appears not to be in the usual Northern Electrics blue. So why has it not been painted? 319448 is a Class 319/4 trains, which are probably the best variant of the Class 319 trains, as they have been refurbished a couple of times and have a First Class section, less 2+3 seating and a Universal Access Toilet. These pictures which show a typical Class 319/4 train, were taken when the trains were being used on Thameslink. So preparing 319448 for service in the North-West was probably a lot easier, than some of the other Class 319 trains. Northern probably needed an extra Class 319 train urgently and bringing it into service in Thameslink condition was probably acceptable to customers and their cash-flow. The exterior painting and the tidying up of the interiors can probably be done later, when there is less pressure on stock numbers. In the Wikipedia entry for the Class 769 train, the serial numbers of the Class 319 trains to be converted are given. 769424, 769431, 769434, 769442, 769448, 769450, 769456, 769458, 769?? ?, 769?? ?, 769??? The first three digits identify the train class and the last three digits the train number in that class. According to Issue 834 of Rail Magazine, 319456 and 319434 are in Loughborough for the conversion. So it looks like 319448 will be converted to 769448. The Wikipedia entry for the Class 769 train, says this about Northern’s initial use of the trains. Northern have indicated that the use of these trains would be of most benefit on routes that are part electrified, whereby they would be able to use the pantograph for the main part, while being able to operate using diesel power away from the overhead lines. The first route to be confirmed by Northern for the running of Class 769 units was the Windermere branch line between Oxenholme and Windermere in North West England. Once the current electrification program between Manchester and Blackpool, Preston and Stalybridge is complete, there are several partially-electrified routes, where Class 769 trains might be used in North West England. Liverpool Lime Street to Chester via Runcorn and the Halton Curve. If the trains are a success, then surely more trains will be deployed around the electrical networks in Leeds and Newcastle. Could the conversion of a Class 319 train to a Class 769 train be something like this multi-stage process. However, due to different operational rules, I suspect that there will be some changes that have to be carried out before the trains can run in the North. 319448 has obviously had these changes. If I’ was going to spend a lot of money converting a train, I’d give it a thorough testing with experienced drivers and engineers to make sure there wasn’t an expensive fault. Northern have a team of drivers with lots of experience of their current fleet of thirty-two Class 319 trains. The train could even be used in passenger service, as it is an unmodified Class 319/4 train little different to the others in Northern’s fleet. The train can then be removed from service and converted to a Class 769 train. The trains can be appropriately tested. Doing this last is probably a lot easier, given that the Class 319/4 trains are generally in a good state cosmetically. I believe if you do the Project Management professionally for the conversion of the eleven trains need by Northern and the extra five for Wales, it will be possible to fit together a very orderly and efficient production line. I can envisage that production of units getting quicker as experience is gained. It took me 8 hours to get back home from Bristol last night. As well as Cross Country strike, TransPennine Express cancelled from Manchester to Leeds due to operational difficulties so by the time I got back to Leeds the last Wharfedale line had long since departed and I had to find a member of staff to provide me with a taxi! At least I’ll get my £39 back but would have preferred a shorter journey. Arriva Trains Wales service stopped 17 times between Newport and Manchester too. what looks like a 319 appears moving on a nearby track ~55s in.